The overall aim of activity 3 is to develop external corrosion loss models for buried pipes as a function of time and soil environment. The approach currently being pursued is to develop a corrosion model based on corrosion fundamentals and on collected and documented field observations. Recent work has involved the collection of corrosion loss and associated soil data at 20 condition assessment sites within Hunter Water’s network, and the use of this data for an initial model calibration for pipes buried in clay soils (see previous A3 fact sheet). The current work is focused on collecting additional field data for model development and also on improving estimates of the long-term average soil moisture content, which is a key environmental variable. 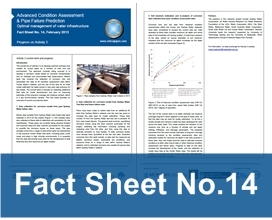 This fact sheet provides an overview of current and planned work.